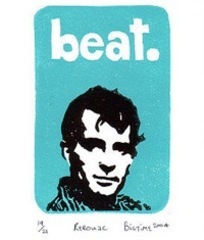 October 21st will mark the 40th anniversary of the passing of great American writer Jack Kerouac. Jack's Last Call: Say Goodbye to Kerouac written by Patrick Fenton, is directed by award winning audio dramatist Sue Zizza, and takes place at the end of summer 1964. Jack's Last Call: Say Goodbye to Kerouac written by Patrick Fenton, is directed by award winning audio dramatist Sue Zizza, and takes place at the end of summer 1964. Based on a recording that was made in Kerouac's Northport, Long Island living room, as he and his mother, Memere, pack to leave for St. Petersburg, Florida - the place where he would finally end his many road journeys - this play blends the reality of that last night with other moments in Kerouac's life to create an image of an artist in transition. On this last night in New York, as Jack hosts a going away party for himself, he thinks back to the America he saw, riding alongside Neal Cassady, as they drove back and forth across the US. Throughout the beer-soaked night, Jack reflects back on fame, the fame he tried unsuccessfully to hide from in Northport, and a cultural shift taking place in America that has him worried that his time has come and gone. As the memories play through his mind, Jack also receives a series of soul-searching phone calls from his daughter, Jan, who is desperate to connect with the man she believes is her father. Scenes from Jack's Last Call: Say Goodbye to Kerouac were recorded on location at Gunther's Tap Room in Northport, NY - one of Jack's favorite haunts - and features music by Composer David Amram, who scored the 1959 Jack Kerouac, Allen Ginsberg, and Neal Cassady film "Pull My Daisy". Narrated by Len Cariou, Jack's Last Call is an honest portrayal of, and an elegy to, the man who wrote On the Road, which helped to shape a generation and a nation. "Great writing, excellent audio mix and effects...a superb piece of work." ~ Tom Lopez - ZBS Foundation. "This play shows Jack at a difficult time in his life, and it does it with a rare understanding of how he tried to deal with the dilemma of unwanted celebrity while finding a way to continue pursuing his goals as an author. Fenton has created a moving portrait of a unique artist, rather than another dreary "Beat" stereotype. Bravo!" ~ David Amram, Composer. This documentary is about two men who, at mid-life, re-read Kerouac's book and get behind the wheel for a 4000 mile road trip of reflection and discovery. In this five-part series Charles Sennott of The Boston Globe retraces the path of "On the Road's" Sal Paradise across America. All five pieces in the series located here. More than fifty years after the publication of Jack Kerouac's "On the Road," the definitive novel of the Beat Generation still enthralls readers with its call to the road. In this five-part series Charles Sennott of The Boston Globe retraces the path of "On the Road's" Sal Paradise across America. Part one finds Sennott in Lowell, Massachusetts, which has come to hold Kerouac in the same high regard as the author had for the city of his birth. It is here in Lowell that Sennott hears the invitation fto the road for the second time in his life, and takes it. Each segment is designed as a drop-in to NPR's Morning Edition segment E. Included here are scripts for suggested host intros and tags. The total duration of each piece with intro and tag is ~7:15 and there is plenty of great music to fill under the rest of the segment. This piece brings together a poem the late Jan Kerouac recorded late one night at WNYC in the mid-1980's - it's a response to the poem read by Jack from the WNYC archives recorded in 1959. This piece brings together a poem the late Jan Kerouac recorded late one night at WNYC in the mid-1980's - it's a response to the poem read by Jack from the WNYC archives recorded in 1959.Two rare pieces of tape that were made for each other. Produced for Hearing Voices, originally aired on Studio 360. Kerouac's 30 points for spontaneous writing have a Zen quality worth meditating on. He was kind of a Buddha for the Beat Generation (except that he, uh, drank himself to death at an early age... oops). He cultivated both spontaneity and craft. He became an icon to thousands of kids with road fever but could have equally been a role model for the serious pursuit of any skill (his pile of notebooks, his endless revisions) -- except for the, uh, methamphetamine part). His 30 points for spontaneous writing have a Zen quality worth meditating on. David Amram talks about mixing jazz and poetry with Jack Kerouac and other Beat poets. David Amram is a prolific composer. He wrote the film score to Splendor in the Grass and The Manchurian Candidate. He's composed more than one hundred orchestral works, and he's collaborated with an incredible range of artists. However, it's his work with poet Jack Kerouac that makes him the unofficial godfather of mixing jazz and poetry. New Hampshire Public Radio Producer Andrew Walsh caught up with David Amram in advance of his appearance at Portsmouth's "Jazzmouth" festival.